Tim Duncan added a little more bling to his already impressive jewelry collection. 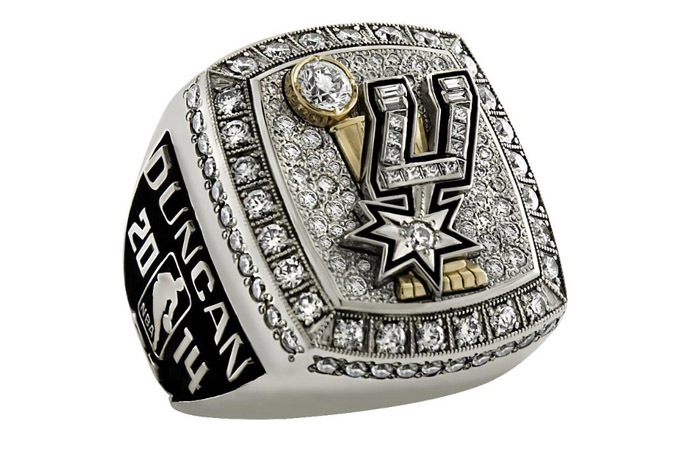 Duncan, along with the rest of the 2014 NBA Champions, San Antonio Spurs received their Championship rings on October 28th. The rings, designed by Masters of Design (a Herff Jones company), are exquisite pieces of jewelry. Each Championship ring contains more than three ounces of 14 carat white gold with 5.09 total carat weight of diamonds. The top includes 76 round, 10 princess cut, and four baguette diamonds. Around the edge of the top are 42 round diamonds. With five NBA titles under his belt, Duncan’s championship ring is sparkling the brightest.